Despite the increasing potential for rain this week, California remains poised to experience exceptional drought conditions in 2014. 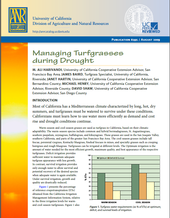 Under prolonged periods of dry weather, weed control is likely to suffer. This is especially troubling for growers as both crops and weeds will be competing to capture limited soil moisture, which could result in significant yield losses.